Skin is the body’s largest organ and constantly renews itself. Unfortunately, dead skin cells can build up and leave your complexion looking dull and rough. Exfoliating products remove dead skin, minimize the appearance of pores and blemishes, and help makeup go on smoothly. These scrubby products come in a variety of textures and formulations, which can make choosing the correct one for your skin difficult. To get the best results, choose a product that is made for sensitive skin even if you think your skin can handle something more aggressive. Some popular exfoliating products contain crushed nut shells, but they can leave tiny tears in the skin. Instead, pick something gentle and use it once or twice a week if your skin is normal to dry. People with oily or combination skin can exfoliate more often, but still shouldn't overdo it. The following tutorial is straightforward, but there are two things to keep in mind. First, never exfoliate skin without wetting it first. You must apply products to clean, damp skin. Second, use gentle circular motions to avoid injuring the skin. 1. After cleansing, thoroughly dampen the face with lukewarm water. 2. Apply a dime-size amount of exfoliating scrub to your fingers and then rub it gently on your face in circular motions. Use minimal pressure, and let the product do the work. Tip: Avoid the under-eye area as the skin there is fragile and can be irritated easily. 3. Wet the facial brush and then work the scrub into the skin in circular motions. 4. Rinse the brush head and your face with cool water to remove the product and close the pores. 5. 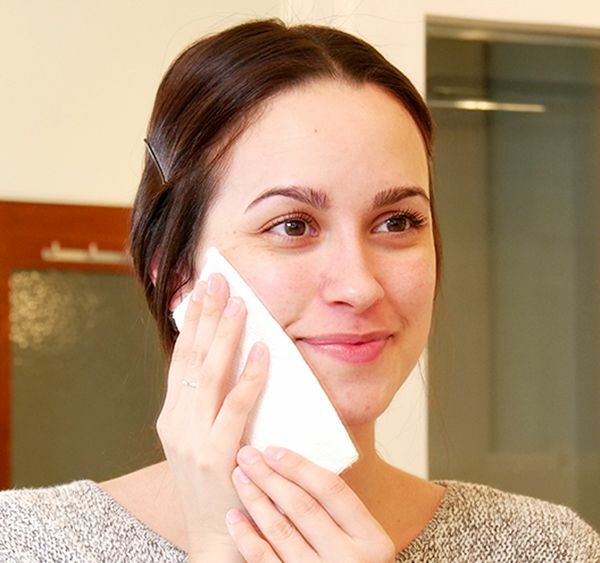 Pat your face dry with a soft, clean towel. Freshly exfoliated skin feels soft and smooth. To maintain that feeling, apply hydrating toner and moisturizer afterward. Don’t forget to use sunscreen if you’re heading outdoors.